An open field, hundreds of one-on-ones and a few slapstick moments–that’s what the North London looked like on Sunday afternoon. As Arsenal’s level dropped in the second half, a 1-1 draw left head coach Arsène Wenger frustrated. Even though Tottenham have now gone seven games without a win in all competitions, picking up one point at the Emirates gives Mauricio Pochettino a desperately needed breather. Before the first whistle, the Argentinian head coach already surprised with his line-up, bringing in Kevin Wimmer as an additional centre-back in order to field a 5-2-3. With Dele Alli not in the squad, striker Harry Kane was flanked by Heung-Min Son and Christian Eriksen. Moussa Dembélé and Victor Wanyama tried to control the middle of the park. As for Arsenal, Granit Xhaka and Francis Coquelin played in central midfield. Other than that, there was no doubt who would wear the red and white jersey against their archrivals. Héctor Bellerín and Nacho Monreal bombed up and down the flanks, with left-winger Alex Iwobi mostly staying near the touchline as well, while Theo Walcott often supported Arsenal’s playmaker Mesut Özil and centre-forward Alexis Sánchez in the middle. Pochettino’s decision to bank on a back five was gutsy and almost backfired. Early on, the three centre-backs basically didn’t know how to narrow the space and to prevent Sánchez’s runs behind the line. Plus, Wimmer and his colleagues nervously left their positions frequently, as they tried to shut down Arsenal’s build-up plays on the edge of the final third. It was a case of the right hand not knowing what the left hand’s doing. That said, Tottenham found a way to control the early goings-on because Arsenal either couldn’t handle the opponent’s pressing or they were simply not creative enough to move the ball down the field without knocking it forward. Granted, Tottenham’s muddled back line could barely defend long balls without tripping or being caught napping by Arsenal’s attacking department. Only occasionally did Tottenham make use of a high press. Mostly, one player ran towards Petr Čech and put pressure on him, yet the coverage in midfield wasn’t tight at all. Wanyama and Dembélé struggled to get a hold of Özil and his colleagues. Arsenal, however, needed at least 20 minutes to figure out how they could effectively create triangles and expose Tottenham’s weakness on the wings. After a while, it became apparent that Pochettino’s team weren’t able to close the space between the centre and the two full-backs. Both Kyle Walker and Danny Rose stayed wide and blocked the outside lane, but therefore left open the respective other side which gave Walcott and Iwobi openings to drift inward. With Dembélé and Wanyama being tied in the middle, the half-space was the place to be for Arsenal’s winger. And if either Rose or Walker followed the ball-carrier, one of the always alert full-backs popped up in the open space at the touchline. Stats sheets showed at the end of the first half that the ball was in possession of Tottenham for 59 percent of the time–though mostly circulating through the deep zones. When trying to start an attacking play, Wimmer and left-sided centre-back Jan Vertonghen moved towards the left side, as Tottenham often intended to play down the left. Arsenal marked all three centre-backs closely and shut down Dembélé and Wanyama as well. Only left-back Rose enjoyed some freedom because Bellerín couldn’t just walk him down and expose the wing. That’s why Tottenham was able to got Rose involved occasionally. Yet, Pochettino’s side couldn’t usually pass the opposing midfield line. When Rose kept a deep position on the left, he tied Walcott on the outside, while Coquelin marked Dembélé. Those situations gave Vertonghen some room to push through the half-space. In the 5th minute of the match, Son fooled Bellerín when he feinted to pick up the ball, but instead let it roll through his legs and quickly turned around to run down the left. His cross-pass didn’t find a receiver, but a pattern how to create goal-scoring opportunities was shown. With Son usually hugging the touchline, Kane roaming around in front of Arsenal’s centre-backs and Tottenham focussing on attacks through the left side, Eriksen often drifted towards the middle, thus closing the gap between midfield and attack. When the Gunners took command during a 25-minute spell late in the first half, Tottenham’s defensive problems helped Wenger’s team create several chances. Apart from aforementioned holes between midfield and full-backs, the back five and especially the execution of Pochettino’s idea of a system including a back five caused much trouble, when Arsenal marched through the wing zones. All defender’s dropped into the box, while Dembélé and Wanyama were busy marking the onrushing centre-midfielders. It inevitably created space that was used by the likes of Özil and Walcott who normally didn’t push towards the offside line. In particular, Özil was lying in wait for a crossfield pass into the zone 14 several times. In the 31st minute, his shot from a position just outside the 18-yard box was fractionally wide. Later, the German international curled over a free-kick that led to Wimmer heading into his own net. He was making his first appearance in the Premier League this season, brought in as part of the back five. The first half didn’t go well for the Austrian as he should have avoided the misplaced header that gave Arsenal the temporary lead. During the first 45 minutes, Tottenham only showed glimpses of an effective build-up play. And almost always, Dembélé was involved showing his tremendous dribbling skills which should become valuable in the second half. First, Pochettino made a slight adjustment at the beginning of the second frame. Dembélé’s switch to a more deep-lying position was a subtle yet important change. The connection between him, Wanyama and Eriksen noticeably improved. Meanwhile, Walker and Rose were asked to push forward more aggressively, taking the risk of exposing the flanks when losing the ball. Second, Dembélé, despite his deeper position, had the licence to roam forward. And it was his run drifting from right to left, passing Coquelin and then coming inside Monreal, that prompted Koscielny to make a dire challenge. The Frenchman tripped Dembélé, rather than touching the ball. Kane took advantage of the situation shooting the ball down the middle from the penalty spot. Tottenham abandoned their strategy of letting the ball circulating slowly through the deeper zones, as their attacking plays looked more straightforward. 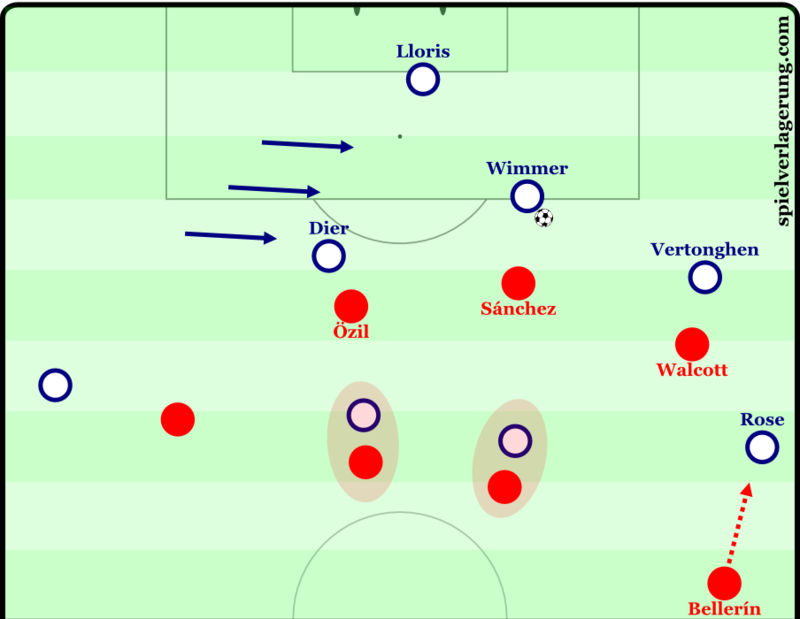 Meanwhile, Arsenal managed to find advantageous positions on the wings, outnumbering Tottenham at first and then following up with aggressive diagonal passes into the half-spaces. After Kane’s equaliser, both teams battled at high speed until the end, while forcing one-on-ones and exposing zones across the field. It was high-level entertainment that didn’t deliver much to write about. With end-to-end chances and last-moment tackles non-stop, both sides had the opportunity to collect three points but failed to do so. Wenger brought on fresh legs following the hour mark. He moved Sánchez to the left, with Olivier Giroud serving as the sole centre-forward. Aaron Ramsey replaced Coquelin, with the Welshman frequently pushing forward helping out Xhaka who had a decent display offensively. Pochettino’s decision to position Dembélé deeper in the second half, but allowing him to make quick runs forward paid off. Meanwhile, Arsenal weren’t able to maintain the degree of intensity and effectiveness they showed during the later stages of the first half. Without any significant tactical changes, the Gunners had to rely on their individual quality and hope to win a few important one-on-ones in order to get behind Tottenham’s back line. At the end, Wenger’s team didn’t score a second time, which means that Arsenal is still winless against Tottenham in the league during the Pochettino era. as i tottenham fan i may have been caught up in the game, but it seemed arsenal really started having success in the forst half when they dropped to a 4-1-4-1, not pressing the tottenham centre backs as much, but denying vertonghen and dier vertical passes into eriksen/son/kane. Did you not think that the two arsenal players that were offside behind Wimmer on the goal influenced him forcing him to get anything on the ball? I think Walcott and Sanchez almost played as wide forwards at times with Ozil as a false nine which meant that the three centre backs had to move forward an engage which I think Wimmer and Vertonghen struggled with. Also as a result of the increased aggression by tottenham in the second half, did you not think it created a greater transitional battle between the two sides? Forcing the game to open up?